1965; 85 pages. Genre : Poetry. Overall Rating : B. A collection of poems, often rushed out at the rate of two or three a day, by Sylvia Plath in the last months of her life, and while alone with her children (Ted Hughes had left her for another woman) and freezing during a bitter London winter. What can I say? Plath is a maestro with words. Here she writes about a variety of subjects. There is the warm love she has for her children. There is also some darkness - especially when she's writing about her Dad and her straying husband. Death makes its appearance as well, but there are not as many lines devoted to it as I had feared. And last but not least - she throws in some cool chemical compouinds - Carbon Monoxide, Arsenic, and Acetic Acid. Yeah go ahead, name any other poem that has the phrase 'Acetic Acid' in it. Although it's a short read, there is almost no rhyming here, and very little meter. That makes it tough on a traditionalist like me. Some of the poems are too vague for me. You almost need notes to understand them. Ariel, for instance, is not about the Shakespearean sprite; it's about a horse she rode at a nearby riding academy. Berck-Plage is about a veteran's hospital she visited in France. There's 4 or 5 poems about bee-keeping. It helps to know Plath had a bee colony in her backyard, and was a member of a beekeeper's club. I've yet to discover why a yew tree keeps showing up in this book. 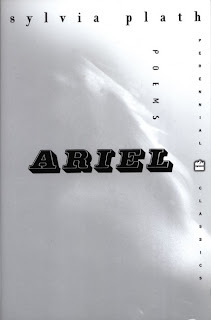 This 1965 version of Ariel was edited by Ted Hughes, who took the liberty of deleting 12 of the poems and replacing them with a dozen of Plath's earlier works. He also decided Plath didn't know the proper order to put them in. Plath's daughter Frieda later put out a version with the correct poems and correct order. When I was at Borders over the weekend, I found there is now a "Collected Poems of Sylvia Plath" which, at 200+ pages, includes everything from Ariel and Colossus, and a bunch of other assorted poetry she penned. All for less than $20. So the version I read is obsolete. In the end, I'd give Ariel an "A" for its biographical insight. But when I step away from that, a lot of these poems could use a bit of polish. I know everything Plath wrote is sacrosanct to her devotées, but objectively, penning 2-3 poems a day means they could've been improved with time and effort. Therefore I give this Ariel a "B", partly cuz it isn't perfect, and partly cuz it's Hughes' inferior version. Ariel has sat on my TBR shelf for quite some time. I read it now because earlier this month, Plath's son, Nicholas Hughes took his own life by hanging after losing his battle with depression. It seemed fitting to pay my respects to him by reading a book of Plath's poetry. Jason got the collected poems for Christmas. I've yet to try to read them. I'm so bad at poetry! Bee-keeping was a big theme in the collection of short stories I read, too. price-wise and content-wise, that 'collected poems' book is definitely the way to go. i almost bought it on Saturday, but realized that 1/3 of it was going to be a repeat. i look forward to Jason's review of it. from what i've read about Colossus, i think i'd enjoy it more than Ariel. I haven't read any of plath, not even The Bell Jar. But I'd like to. Should I start with that? Sounds like one should know about her a bit before jumping in to her poetry. The Bell Jar is one of my fav books!! I don't know how it compares to her poetry, but I still highly recommend it. yes...I agree reading the full collection of poems is best. I still enjoyed Ariel.